What was the very first PS3 game you've played? Now that this generation is slowly coming to an end, I'm curious. What was the very first PS3 game you played? For me, I think the first game I played was actually Assassin's Creed, and shortly after, Uncharted Drake's Fortune. I remember first popping these two games in, I was all like "Oh mer gerd, the graphics are AMAAAAZING! And you can climb anything in Assassin's Creed! WTF?" And then I went ahead and started ramming my face against my PS3 cuz I couldn't handle the awesomeness. Okay... take out that last part lol. But what was the very first PS3 game you've played? Resistance Fall of Man...those graphics were awesome back then! Then I played Metal Gear Solid IV...my mind was blown away. MLB 08: The Show. When I first saw that running on a PS3, I just knew I had to have one. Motorstorm, at a Best Buy kiosk. What great fun I had. Still the best Resistance game, IMO. Resistance fall of man.. and ill never forget that experience. I got it with my first PS3, and played it on SD TV. Even so, I just remember being in such awe with the visuals. I think it was Motorstorm, graphics were amazing at the time. It was definitely LittleBigPlanet. I got my PS3 right before 2009, and I also had and played Call of Duty: World at War and GTAIV early on. Lol I like how Resistance Fall of Man is the dominating game in this thread lol. When was Resistance Fall of Man released? Wasn't it like within the first few months the PS3 was released? It was a launch game. First games I played were AC and the first Uncharted at a friend's house, but the first game I properly owned and played was Uncharted 2 followed by Killzone 2, both of which blew me away graphically and turned out to be pretty awesome games. RE5 at a friends house. Not counting demos, the first PS3 game I played was Ratchet and Clank Future: Tools of Destruction. Batman Arkham Asylum. I was a little late to this generation, but when I finally bought a PS3 Batman was my 'must buy' first game. I even skipped the 2 games my PS3 came bundled with. I'm pretty sure it was either the original Uncharted or MLB 07 the Show. Fallout 3, which I hated the first time I tried it. I think I gave up on it after a few hours... when I tried it again a year or two later, I loved it though. I think the first game I completed was Wolfenstein. Both of these games would make my Top 20 this gen. I got my PS3 in 2010 with Batman Arkham Asylum and it was truly awesome. The second game I got for the system was inFAMOUS and that was also amazing. I played both of those games to death and platinumed them. Resistance 2 came with my ps3 and what a terrible game it was. Resistance Fall of Man at my friend's house. I was so jealous of him. Didn't get a PS3 of my own until several years later. Lol, dude when I first got a PS3 it was because of the same reason too lol. I went to a friend's house, and he was playing Resistance. And I got so jealous cuz the game just looked EPIC especially with the graphical leap. The following Black Friday... I ended up getting a ps3 lol. Metal gear solid 4. Waiting for that game to instal killed me! wanted to play it so bad haha. College Hoops 2k7. Boy was I excited and I loved the graphics. LittleBigPlanet. Played for about 2 hours and never touched it again. NBA Live 08, followed by Battlefield: Bad Company and Lost Planet: Extreme Condition. The very first PS3 game I played was God Of War 3 at a friend's house. Got my PS3 late 2011 and broke it in with MGS 4 followed by Uncharted 2. Back to back epicness and a great induction into current gen.
Super stardust HD on someone else's PS3. Neat game. Think a spiritual successor is in the works. MGS4:GoTP (when this game was released it was over for me, i couldn't control myself so i immediately bought a ps3, wanted to play this badly) with GTA4 and Uncharted Drakes Fortune. The first time i had my own ps3 i still use my sdtv, still i noticed the difference visually, then months later i was lucky enough / was able to manage to finally own an hdtv, i almost had a heart attack playing the games on it for the first time. Now i wish i still have my old sdtv for my ps2, i regret it. 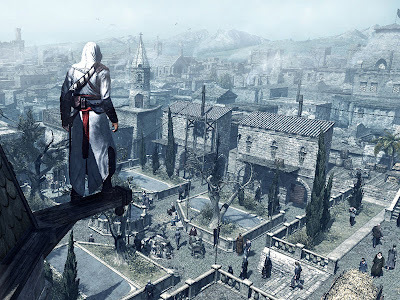 Assassin's Creed, loved the freedom the game offered. Mine was Wipeout HD Fury in '09 when it was released hard copy for PAL. GTA IV, FF XIII and Fallout 3 were the first games I ever owned for my PS3...don't know anymore which I played first though. I think mine was Oblivion or Assasins Creed, i remember just being like oiuyhgfdcghbgfgfhm this is actually the best thing ever. Especially Oblivion, i couldn't quite comprehend how good it was.